Shadow Gallery is not one of those bands. Make no mistake: as far as operatic, chops-intensive, over-the-top uber-prog is concerned, Shadow Gallery are unquestionably masters of their craft. 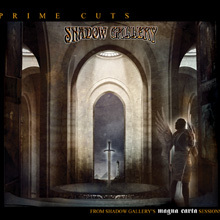 With Prime Cuts, the band has reached back into their Magna Carta catalog and personally culled their favorite tracks from those four albums to show the world what they’ve been doing to advance the cause of prog-metal for the past 15 years (longtime fans will also delight in the previously unreleased “Rule the World”). However, those very gifts are also ultimately this compilation’s demise. Yes, Shadow Gallery has chops. Yes, Shadow Gallery has interesting arrangements. And yes, Shadow Gallery even has some killer hooks. What they lack are songs in and of themselves. Part of this, of course, is due to the contents of this album being taken from larger pieces not meant to be bound by the, um, “constraints” of the ten-minute epic format (yeah, they’re that progressive). The end result comes off as more of a mixtape gone wrong, a well-intentioned product of that kid who sat in the back of your high school biology class and wore all those weird Testament t-shirts, showcasing a band that just doesn’t rock as hard as he swears it does. Taken out of context, many of the story songs from Shadow Gallery’s concept pieces lose meaning and instead become disjointed, at times even bordering on the ridiculous. It’s not that the disc is without its great moments, but there simply aren’t enough of them to make this a compelling addition to anyone’s music library. This is a group that has always worked best, both for itself and for its devotees, by making big statements. Putting a band like this in a track-based compilation format is the equivalent of telling people how cool Michael Jordan’s shoes were. In theory, Prime Cuts should be a nice primer on prog-metal for the uninitiated. In execution, unfortunately, there’s not much here that would be of interest to anyone who wasn’t already a fan of the genre, or of Shadow Gallery for that matter – which, if you think about it, almost defeats the purpose of this collection even existing in the first place.